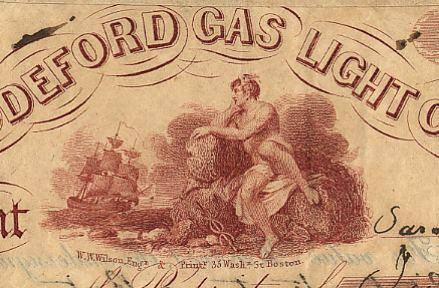 Beautiful certificate from the Saco and Biddeford Gas Light Company issued in 1863. This historic document was printed by W.W. Wilson Engravers and has an ornate border around it with a vignette of an allegorical man sitting on a rock wuth a ship at sea in the background. This item has the signatures of the Company's President and Treasurer and is over 146 years old.